The end of the world is nigh! Soon, the earth will be bombarded with great cataclysmic events: fire, floods, quakes, meteors, hot molten magma, alien invasion, kraken rising from the deep. Lucky for you, Zabvotski - resident genius at Snark Industries - and his assistant Napoleon have been busy crafting a top-notch apocalyptic survival capsule. 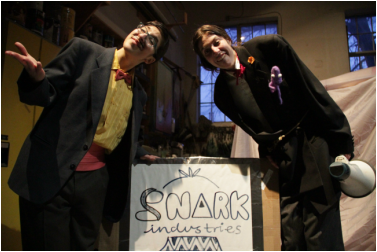 Come down to the laboratory and witness the snArk's indestructibility with your very own eyes before you buy. Available in three state-of-the-ark models to suit all budgets. A 2012 Spark Festival Mini Play presented at the Belfry Theatre. Created and performed by Emma Zabloski and Janet Walker in the Belfry's paint shop.